In the steel industry, how do large steel manufacturers maintain its top position in the global market? For an established steel manufacturer who wants to maintain its competitive edge, it should have an efficient and productive operation. Every process in steel-making must install and run a reliable operating system. However, some of the challenges that hinder an operation’s continuous momentum are the presence of bottlenecks and inefficient operator-machine interaction. This includes processes that do not contribute value to production accounts to 50% of inefficiencies. It slows down manufacturing and increases revenue losses. One of the best ways to improve and create streamlined workflow is ergonomically-built industrial workstations. Workstations with embedded computing devices enable an operator to have a smooth and continuous flow of production line whilst maintaining quality work. Thus, reducing bottlenecks in a workflow will make a great significance in overall processes. So, why choose to build a rugged workstation in steel production? How can steel factories take benefits from it? Learn more about this blog to better understand how it can improve a steel-making production. A steel production line tends to experience work backlogs because of its uncoordinated processes. This capacity constraint prevents work or production from transitioning to the next phase smoothly. Moreover, delays in terms of turnaround time also inhibit the potential quantity and quality of steel production. But, building an industrial workstation can significantly help in reducing backlogs in steel operations. By mounting a compatible panel PC on workstations, it provides an ease of use for the operators and fast-track an automated process. 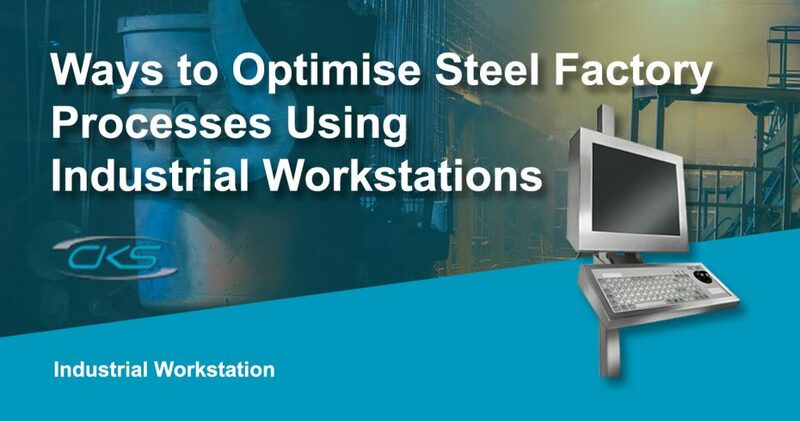 So, in the next section, find out more about the key advantages of having a workstation installed in steel factories for manufacturing operations. What makes a rugged workstation advantageous in steel making? This industrial equipment is built ergonomically to enhance the operational dynamics, therefore increasing the revenues. Industrial workstations have mounting options, which makes it easy to install a ruggedised panel PC. Operators can comfortably pilot automation programs. So, it increases productivity whilst reducing possibilities of miscalculations. Stainless steel workstations are also reliable. It does not easily break down even with the presence of heat, dust and extreme temperatures. With its high IP/NEMA sealing rating, it provides additional protection to moisture, dust and extreme temperature to last over extended periods of time. A ruggedised PC along with its necessary peripherals can be integrated into one industrial workstation. It creates an ergonomically-designed station so that operators can do essential computational functions in one place. As a result, operations are more streamlined. Utilising rugged workstations can help in reducing obstacles to a smooth operational workflow. Therefore, there is an efficient management of resources and avoid unnecessary expenditures due to backlogged production. Industrial workstations with installed industrial computers allow personnel to maximise its full functionality in an efficient manner. Hence, steel operators can have better work quality. Indeed, ergonomically-designed ruggedised workstations create a significant contribution to overall production rate. The increased ROI, improved production rate and reduced miscalculations in operations are notable advantages of this equipment. As a result, steel manufacturers are able to keep up with the challenges and competition in the steel market today. Look for an industrial equipment provider for more information about industrial-grade workstations for steel manufacturing.